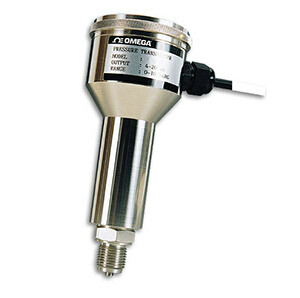 OMEGA’s PX920 Series are extremely tough process transmitters suitable for use in demanding process and industrial applications. Rugged stainless steel construction, featuring S.O.S. technology with a custom IC amplifier, give the PX920 series high stability, low drift and long life. Important features of this transmitter include easily accessible zero and span adjustment for simplified set-up and recalibration. SOS construction uses very stabil solid state silicon strain gages on a Sapphire carrier which is glass bonded to a titanium diaphragm. This combination provides a very durable transducer which has excellent stability over a wide temperature range. Additionally, the all titanium diaphragm and Stainless Steel wetted parts provide maximum durability and corrosion resistance to harsh industrial chemicals.